This article details the steps required to enable SQL Server full text search support within InstantKB & an on-premise instance of SQL Server 2008, 2012 or 2016.If you prefer you can also script the creation of your catalog and full text indexes. 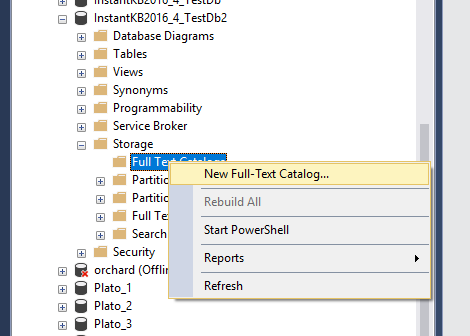 For further information on creating your catalog and indexes via TSQL script please see "Enabling Full-Text Search within InstantKB within an Azure SQL Database ". This will popup the create catalog wizard. You can provide any name you wish for your catalog. We suggest leaving the majority of settings as the default when creating your catalog. You will have the option to amend catalog settings later. Once you've created your catalog the next step is to add the database table columns we want to index into the catalog. For a complete list of columns that need to be included within the catalog please see the section below. You must go through each table listed below and define a full text index for each table. 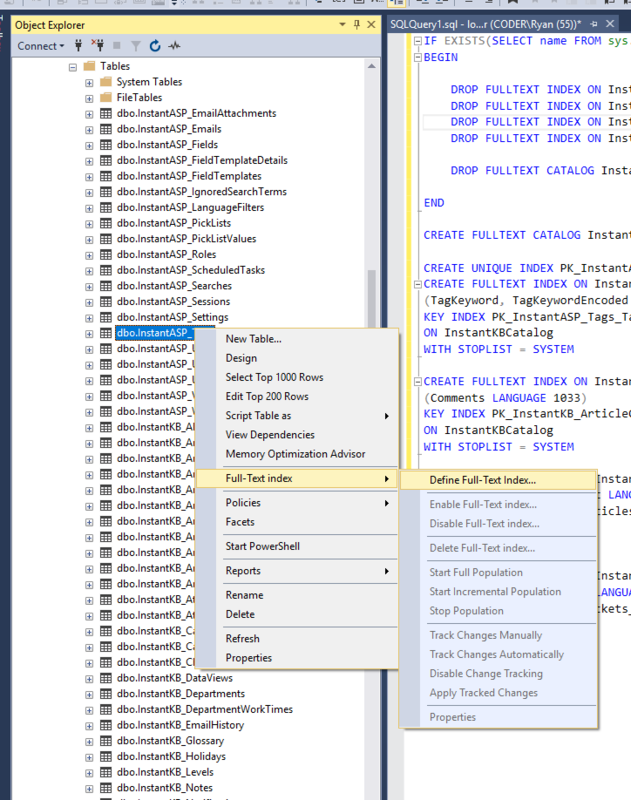 When creating the full text index you should include the columns for the table also listed below. The define index dialog is wizard based. You can use the default settings when creating each index however you must ensure you include the database table columns listed above. To learn more about the difference between ContainsTable & FreeTextTable please see the related links at the bottom of this article. For further information on searching attachments stored within InstantKB please see "Searching Attachments witin InstantKB". I hope this information helps. Please don't hesitate open a support request or contact us should you have any questions.